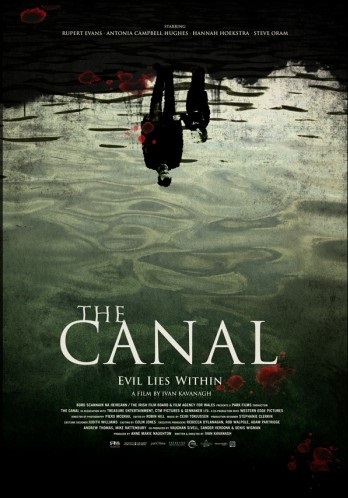 Film archivist Rupert Evans, facing up to the fact that his wife (Hannah Hoekstra) is cheating on him, obtains a police archive film from 1902 containing images of the previous occupant of his house, a chap who murdered his wife, children and nanny before dumping them in the nearby canal. The footage starts to haunt his nightmares, and he rapidly loses grip on reality when Hoekstra disappears, the cops convinced that he has killed her in his increasingly unstable mental state. Cleverly executed so that we are constantly unsure as to what we are seeing is either an old fashioned haunted house story or the delusions of a man in the midst of a breakdown, THE CANAL commendably avoids groan-worthy cheap scares, to which we have become accustomed. Instead, from the get go, it sustains a remarkably sombre and eerie ambience of sustained dread, the perfectly pitched pace yielding fleetingly visceral jolts and some potent frights (notably a harrowing father-son Skype conversation on a laptop). Writer-director Kavanagh superbly freaks us out with figures in windows, mirrors and old film clips, though his obvious adoration of RINGU does result in a key climactic sequence marred by a direct lift from perhaps the most famous shock moment in the entire J-Horror canon. Nonetheless, everything else hits the bullseye, from Evans’ suitably haunted central performance to the staggeringly bold and bleak final sequence – the kind of gut-punch ending few Hollywood chillers would have the balls to deliver.